The Solution below shows the 7th note intervals above note D, and their inversions on the piano, treble clef and bass clef. This step shows the D seventh intervals on the piano, treble clef and bass clef. This step identifies the interval quality and formula / spelling for each note in the major scale, then identifies the seventh note of the major scale, and decides whether the interval quality is either perfect or major. This rest of this page will focus on the relationship between the tonic note - D, and the intervals surrounding the 7th major scale note - C#, whose interval quality is major. So we will definitely see extra sharp or flat spelling symbols there. 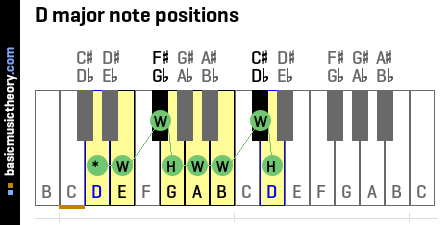 This step identifies the note positions of the D 7th intervals on a piano keyboard. Having established that the major 7th interval of the D major scale is note C#, this step will explore the other 7th intervals next this note. 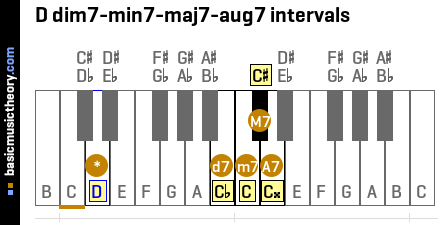 This step identifies the note names of the D 7th intervals on a piano keyboard. 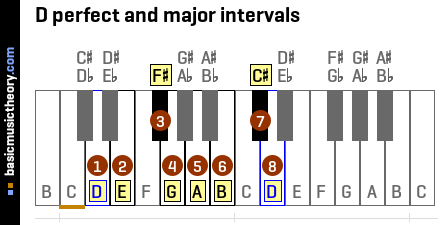 To calculate the correct interval names, just like the previous step, the major 7th note is used as the starting point for working out interval information around it. The major 7th note name is C#, and so all intervals around it must start with the note name C, ie. be a variation of that name, with either sharps or flats used describe the interval difference in half-tones / semitones from any given interval note to the major 7th. But why is this done ? To get the missing piece of the puzzle, we need to return to the interval number - the 7th. Not only does this number describe the note number of the major interval in the major scale, but it also describes the number of either lines or spaces on the staff between the tonic note and all intervals sharing that number - 7th, be they called diminished, minor, major, perfect or augmented. On either the treble or bass clef above, count the number of lines and spaces - starting from 1 at the tonic note (the lowest note), and ending on a given interval, and the last line or space having the interval you want will be 7th line or space. 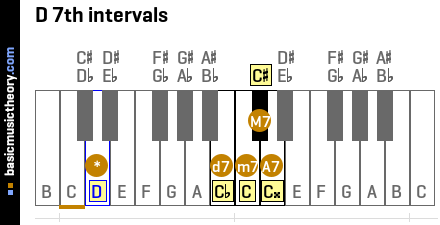 So this naming system forces all related 7th intervals to share the same treble / bass clef line or space, as ultimately they are all 7ths, but each interval having different interval quality names (major, minor, diminished etc). 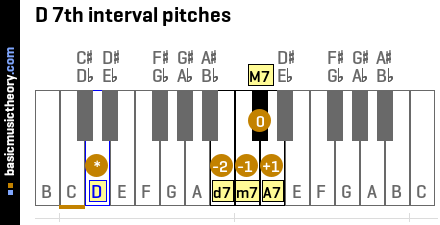 This step explains how to invert note intervals, then identifies the D 7th inverted note intervals shown in previous steps. For example, in the steps above, one of the intervals we measured was a major 7th above D, which is note C#. In contrast, an inverted interval specifies the distance from C# to D - ie. note D is above note C#.